I shot this image of Monet’s water gardens at Giverny with my iPhone camera, and processed it into three versions on the spot. Instant gratification is sweet! But I’m also looking forward to seeing what my images with the D800 look like. They may take a bit of time to process. It’s fair to say that my entire group had a great time at Giverny, it is truly a highlight! One nice thing about processing on the iPhone is that it very easy to see what difference a slight shift in colors makes. Fun I think to take a subject that is so very colorful, and render it in black and white. I am looking forward to printing all three together. If you know me, you know that I am nuts about photographing spiral staircases. The Hotel D’Orsay in Paris has two, one with an elevator running up the middle, and the main stairs, which has five flights in a narrow spiral formation. This kind of staircase tends to be harder to photograph than meets the eye. First, they are rarely well lit. This means a long exposure if you are stopping the lens down to get enough depth-of-field for most of the spiral to be in focus. The problem with a long exposure is that this kind of old staircase is usually they are rickety and transmit vibrations. If anyone comes up or down the stairs, they are likely to spoil your exposure just by walking past. Another issue is holding the camera steadily above the stair for a straight shot down. You need a good tripod and steady nerve, but you can usually brace the tripod against the railing to make this possible. To make life easier and avoid all the trouble, simply shoot the spiral staircase with your iPhone! A well-polished breakfast service at the hotel makes for iPhone fun when playing with my place setting! In the afternoon the rain started to come down hard, with a lush, almost tropical sound as it fell hard on the rooftops of Paris. I went upstairs because I had left my window open. I stuck my head out the window before I shut it. Around the corner was a hint of a rainbow. I grabbed my camera, dashed downstairs in my t-shirt and jeans, took an umbrella from the bin next to the front desk, and ran the two blocks to the Seine River. 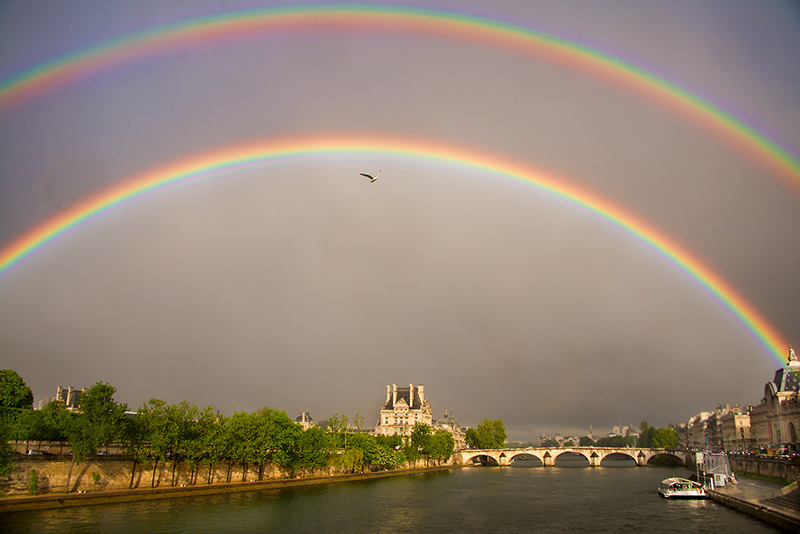 A double rainbow was forming, upstream in the direction of the Louvre and the Musee D’Orsay. Precariously balancing my camera and using the umbrella to shelter it from the wind and rain I snapped a few photos. One of my favorite places in Paris is the garden behind the Rodin Museum, where I went this morning. Of course, a Rodin garden would not be complete without Rodin’s sculpture. It was fun photographing the famous sculptures in the rain, which added to the textures and feeling of the place. The face of “The Thinker” is shown here, overexposed and processed for high-key. Spring in Paris means that sometimes it rains, which can make it all the more romantic. I took advantage of the moody light today to photograph along the Seine River. From time to time rain squalls hit, and my camera and I went for cover under one of the bridges. I used a long exposure (two minutes) to flatten the moving water and give and old-fashioned appeal to this shot of the Pont Royal. Exposure data: Nikon D800, 35mm Zeiss lens, circular polarizer, +4 ND filter, 120 seconds at f/13 and ISO 100, tripod mounted. Drape the white bed sheet so it forms a seamless background on a table. Put the daisy in one of the vases. Place the vases one behind the other, with the daisy in the rear vase. Place the pedestal under the sheet to raise the front vase. Mount the camera on the tripod, and attach the remote release to the tripod. Attach the extension tube to the camera and the moderate telephoto lens to the extension tube. Using manual exposure, with the ISO set to 100, stop the lens all the way down (to f/16 or f/22). Wait for the light to beam directly on the rear vase. Set the shutter speed to complete the exposure equation in relation to the incoming light in terms of the shutter speed. Hold the depth-of-field preview button down and wiggle the camera into position to best focus on the refraction of the daisy in the front vase. Expose the image with the remote release. Convert to monochrome. Hint: It is all in the seeing. Are you intrigued by transparent flower photos? Ever wanted to know how to make them? Well, here’s your chance! With photography on a light box, once you photograph a bracketed high-key exposure sequence, then the the next step is to assemble a layer stack. As you build your layer stack, successively darker layers are masked and painted in to create the illusion of transparency. The results surprise and delight! Learn this exciting technique from its creator! This webinar will be full of examples and have ample time for Q & A. Register for Painting in Transparency Using a High-Key Layer Stack Webinar with Harold Davis today (details below). When: The live webinar session will take place on Saturday, May 31, 2014, starting at 3PM PT. The webinar is scheduled for one hour, with additional time for Q&A. The session will be recorded, and you can review the recording at your convenience. Prerequisite: Basic knowledge of Photoshop. Where: At your computer, anywhere. Cost: The registration fee for the live webinar is $29.95. This includes access to the recording of the webinar session. The cost for access to the webinar recording alone (this will be available after the session) is $19.95. Registration: Registration for the Using Backgrounds and Textures with Harold Davis is limited to 20 participants. Click here to register for the webinar. Seats are very limited, so register now to avoid disappointment. 2014.05.24—Selective Sharpening with LAB Color Webinar with Harold Davis. Click here for information and here to register. There is a nominal charge. 2014.05.29—Using Backgrounds and Textures with Harold Davis. Click here for information and here to register. There is a nominal charge. 2014.05.31—Painting in Transparency Using a High-Key Layer Stack Webinar with Harold Davis. Click here for information and here to register. Have you ever wanted to turn your photos into fine art design pieces? With a little bit of Photoshop know-how, a few inexpensive tools, and the techniques explained in this webinar, it’s easy to create unique art imagery, guided by your vision and creativity. Placing a photo on a background creates an image that looks like a botanical illustration. Adding a texture to a photo is can be used for an impressionistic and/or painterly effect. It’s easy to add a whole set of techniques to your creative use of Photoshop! Register for Using Backgrounds and Textures with Harold Davis today (details below). When: The live webinar session will take place on Thursday, May 29, 2014, starting at 7PM PT. The webinar is scheduled for one hour, with additional time for Q&A. The session will be recorded, and you can review the recording at your convenience. The landscape in Venice of Cuba (shown above) was enhanced with the addition of a canvas-based texture, creating a work of art with a painterly ambiance. The photo of the model Kelly (shown above) was first placed on a background, then treated with a texture overlay. If you answer “Yes!” to either of these questions, then this webinar is for you! This webinar shows how to use the properties of LAB color to selectively sharpen images for aesthetic effect, and teaches you a technique that should be in the toolkit of every photographer who uses Photoshop. Click here to register for the webinar. When: The live webinar session will take place on Saturday, May 24, 2014, starting at 3PM PT. The webinar is scheduled for one hour, with additional time for Q&A. The session will be recorded, and you can review the recording at your convenience. Registration: Registration for the Selective Sharpening with LAB Color with Harold Davis is limited to 20 participants. Click here to register for the webinar. Seats are very limited, so register now to avoid disappointment. To emphasize the distinction between the flower core and the petals in Nature’s Palette (shown above) I used LAB color and masking to selectively sharpen the flower centers. This is a relatively subtle technique, in the sense that the viewer is not necessarily aware that I have increased the “sharpness differential” between the two types of subject matter. Gardens in Japan are almost never just about nature. The key point in a Japanese garden is how the natural elements interact with structural and human elements. The style of Isuien Garden in Nara is specifically to use extrinsic elements—landscapes and structures that are outside the domain of the garden—to enhance the garden itself. My image echoes this stylistic idea by including only the reflection of the temple in the pond, in addition to the stone footbridge and natural reflections. I wanted to post current information about our portfolios: Botanique, Monochromatic Visions and Following the Kumano kodo. I am very excited that both Botanique and Monochromatic Visions were featured in Fine Art Printer Magazine. We’ve sold through number 15 of Botanique, which combines aspects of a handmade artist book with some of the features of a portfolio. This is my most successful portfolio to date! The remaining copies, numbers 16-25 are available, at prices starting at $1,950. Click here for more information about Botanique. Copies of Monochromatic Visions (numbers 4-12) are available, with current pricing at $1,200. Click here for more information about Monochromatic Visions. Please feel free to contact me if you have any questions, or are interested in one of my portfolios or one of the prints made in my studio! Rain in California this spring has been sorely needed. It has fallen intermittently and blessedly heavy at times—but never enough to stop the drought or replenish the reservoirs. After one such downpour, I went out with my camera searching for waterdrops. It was late afternoon, and the rain had stopped. The setting sun turned drops of water to natural jewelry. I crossed the street, and positioned my tripod near a large and wet patch of decorative grasses. The sun was low in the sky and reflected off some of the grasses. To the extent that I focused close, the reflection of the sun was refracted by the diaphragm blades within the lens. The closer I focused, the larger the solar refraction. If you look at the image, you can see that I focused on the tiny drop of water in the mid-to-lower left, and that the “solar flare” of refracted sunlight shows the polygonal shape of the opening within my macro lens. To see more of my photography of natural waterdrops, please check out my book Photographing Waterdrops: Exploring Macro World with Harold Davis (Focal Press). Exposure data: Nikon D800, 200mm f/4 Nikkor macro lens, 36mm extension tube, +4 close-up filter, 1/400 of a second at f/5.6 and ISO 400, tripod mounted.